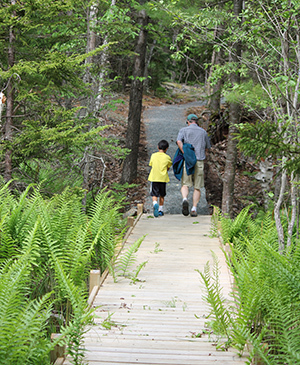 Since 1996, Friends of Acadia has been putting Village Connector Trails on the map. These trails re-establish the tradition of walking and/or biking into Acadia National Park, into town, and in neighborhoods. 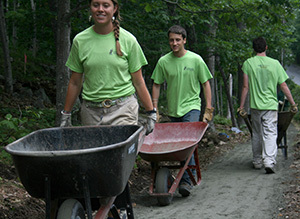 Village Connector Trails (VCTs) enhance the character of Mount Desert Island’s villages, and improve the quality of the island’s air by reducing the number of cars on island and park roads and at trailheads. Connector trails complement the Island Explorer buses, providing another option to get into the park, out into quiet landscapes, or to in-town destinations. The trails provide an opportunity for a long, one-way hike or bike ride with a return by bus. Please walk bicycles on Village Connector Trails except the Western Mountain Connector. Giant Slide Trail: Access off Rt.198 to Northeast Harbor. Connects to the Giant Slide Trail and Around Mountain carriage roads. Duck Brook Connector: Access beside the Acadia Inn on Rt. 3 in Bar Harbor, across the street from College of the Atlantic. Connects to the Duck Brook Road and the Duck Brook carriage roads. Great Meadow Loop: Access off Cromwell Harbor Road in Bar Harbor. Connects to Jesup Path, Kebo Connector Trails, and much more. Schooner Head Path: Access off the Compass Harbor Trail in Bar Harbor. Passes by the Jackson Lab and out to Schooner Head. Western Mountain Connector: A multi-use path (bicycles allowed) from the south end of the Lurvey Spring Road to the Western Mountain Road in Southwest Harbor. Quarry Trail: Access from Blackwoods Campground or Grover Avenue in Otter Creek. Connects to the Otter Cove Trail and on to the Ocean Path, Gorham Mountain, and beyond. The Quarry Trail is not officially a VCT because it is located on park lands; however, it does serve the function of making it possible to walk into the park from an Otter Creek home or a Blackwoods campsite. A map showing the Village Connector Trails can be found on the ANP website: https://www.nps.gov/acad/planyourvisit/hiking.htm or https://www.nps.gov/maps/embed.html?mapId=ecbed5df-8db1-4437-934c-a11feb066dca for the full-size map. Note that there’s a little box to change views (“Park Tiles 3,” “Esri Topo,” or “Mapbox Terrain”) and you have to flip between them to see all the roads, distinguish between carriage roads and hiking trails, and figure out other details.